Healthy eating can be easy. It's all about balance. With more and more types of foods available at markets across the country, it can be overwhelming to figure out just what to eat for optimal health. But healthy eating doesn’t have to be hard — or expensive. It’s time to simplify healthy eating, starting with some basics. Eating a variety of fruits and vegetables, plant and animal proteins, heart-healthy fats and whole grains is the best foundation to support good health. While personal preferences, food allergies, or medical concerns may vary, use this “starter set” of seven top foods that are not only nutrient rich, but also economical and versatile, as a foundation for your own personal plan. Eggs are one of nature’s perfect proteins since they contain complete, high quality protein that is easily digested. A nutrient powerhouse, one large egg contains about 75 calories, 8 grams of protein, 5 grams of fat, along with a variety of vitamins and minerals, including B-vitamins, selenium, and vitamins A, D, and E.Choline, a nutrient important for brain health — and one most people don’t get enough of — is another special benefit of eggs. While eggs may be high in cholesterol, they are low in saturated fat, a combination that studies have shown does not elevate blood cholesterol. 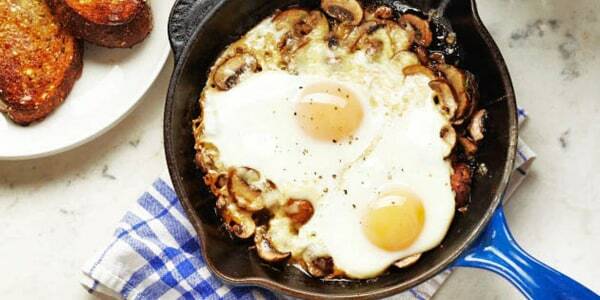 If you're watching your cholesterol levels, opt for egg whites-only. Plus, eggs are economical and have a long fridge life of several weeks. As for what type to buy, brown and white eggs are nutritional equals — they simply come from different kinds of chickens. However, eggs are now available with reduced amounts of cholesterol and higher omega-3-fatty acids. These designer eggs are pricier because the chickens are fed a special diet to produce eggs with a different nutrient profile. Potatoes are one of nature’s most nourishing and nutrient rich carbohydrates. One medium potato (that's about the size of your fist) has about 110 calories and nearly half your day’s requirement for vitamin C, along with potassium (more than a banana), vitamin B6, magnesium, and a hefty dose of fiber when you eat the skin. While potatoes get a bad rap for being high in calories, it’s only because they’re often loaded with extras like cheese, salt, sour cream, and bacon, which pack on added fats and oils. Whether baked, boiled, or mashed, potatoes on their own are a satisfying starchy carbohydrate, especially for those watching their weight. Both white and sweet potatoes are nutrient rich, but sweet potatoes have the added benefit of extra vitamin A in a sweet potato. Don't forget, potatoes are also free of gluten. Red meat can be an important part of a healthy diet when the meat is lean and served in small portions. There are more than 25 cuts of lean red meat available and flank steak is among the most popular for its taste and affordability. 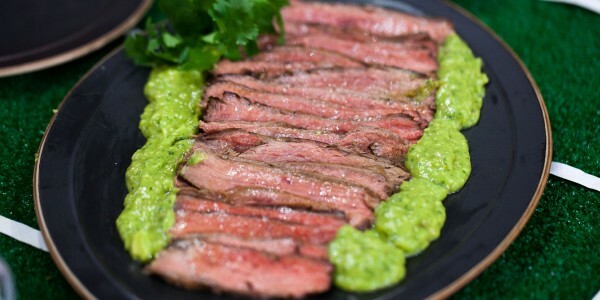 As a lean red meat, flank steak is a super source of vitamin B12 and iron — both major nutrients to prevent anemia. A 4-ounce serving is also rich in protein with about 25 to 30 grams of high quality, complete protein. A modest serving, about the size of a computer mouse, can support muscle tissue, brain function, blood cells and the immune system, among other systems. Processed and fatty red meats like sausage are not part of the healthy picture and you shouldn't be eating huge portion sizes (like 12 to 16-ounce serving), as extensive studies have demonstrated. But flank steak, which doesn't contain a lot of fat, is more economical because it’s not tender and must be marinated prior to grilling. Yogurt comes from milk and contains the same set of nutrients, plus more. A 6-ounce serving of plain, low-fat yogurt has about 9 grams of complete protein (or double that amount for strained, Greek-style yogurt), calcium, vitamin B-12, potassium, and magnesium. One serving of yogurt has about one third of your calcium needs for the day! Yogurt, like milk, is also fortified with vitamin D.
While these nutrients support strong bones and teeth, yogurt is also a natural source of probiotics — healthy bacteria that support a healthy digestive track. Probiotics are also thought to contribute to a healthy immune system. Buy a large tub of plain yogurt, scoop out a single serving, and add fruits, nuts, or other low-sugar toppings for variety. Yogurt can be eaten at any meal, as a snack, and as a swap for high-fat sour cream in recipes. Stick with low fat or non-fat yogurt to limit artery-clogging saturated fat from any full fat dairy product. Keep in mind that many people who are lactose intolerant who lack the enzyme to digest milk, can digest one serving of yogurt a day. That’s because the healthy bacteria in yogurt contains lactase, the enzyme needed to digest lactose in milk. Colorful vegetables are a mainstay of healthy eating. And carrots are plentiful and economical, plus they're available year-round. They are also a powerhouse of beta-carotene (vitamin A), and fiber. Like most vegetables, they are also high in water, which helps support hydration. Carrots are crunchy and sweet, so they're veggie accepted by children and adults alike. It’s often one of the first foods for babies, because of its taste and texture. A versatile veggie, carrots can be eaten raw, cooked, in a smoothie or soup and as the base of side dishes to support other, less popular veggies (like peas). While mini-carrots look like “baby” carrots, these are actually whittled down pieces of very large carrots. You can find true baby carrots, which are picked when small for a tender treat, but they are pricey and a specialty item. Stick with regular carrots in the bag for a sweeter taste and low price point. While organic and conventional carrots both contain the same nutrients, wash both types thoroughly before eating. And peel the carrots if you’re concerned about any dirt particles on the skin, even if you lose a bit of fiber. Few foods can beat tree nuts for a nutritious punch of protein and heart-healthy fats. Nuts are a good source of omega-3-fats, fiber, vitamin E, and the amino acid arginine. Together, these nutrients support heart health and circulation, as well as both muscle and brain function. A superb plant protein, tree nuts — like almonds, walnuts, cashews, hazelnuts, pistachio nuts, and Brazil nuts — are very versatile. A perfect snack, garnish for vegetables, mashed into a “burger,” or used as an oil, nuts are economical and available everywhere. It’s often hard to control portions, so try pistachio nuts in the shell, where a serving is about 39 nuts, with about 160 calories. Because nuts are so calorie-dense, it’s best to limit to one or two servings a day. Keep in mind that adding nuts as a source of heart healthy fat won’t do your heart any good if artery-clogging fats (like those found in dairy and meat) are not reduced. Does an apple a day really keep the doctor away? Science seems to think so! Apples are loaded with vitamins, minerals, fiber, and water. They are rich in antioxidants and flavonoids — the polyphenol compounds also found in grapes and red wine thought to boost heart health. With about 100 calories in a medium apple (about the size of a baseball) apples are a boon to dieters because the crunch provides a lot of eating satisfaction and they're nice and sweet. For optimal nutrients, don't forget to eat the skin, where many of the nutrients are found. Produced worldwide, fresh apples are available year-round, with many different varieties. Plus, apples are delicious raw or cooked and with so many varieties available, they never get boring. Healthy eating can be easy. It’s all about balance. Remember that the key to food supporting a healthy body is to eat these and other high-nutrient foods regularly — not just once in awhile.